First launched in 2003, Marvel Adventures is a line of Lighter and Softer comics featuring some of the company's top characters and set outside of the 616 canon that most Marvel Comics characters inhabit. Each issue contains a story that's finished by the end of the last page (though setups for larger larger arcs sometimes occur), and does so in a lighthearted fashion where everything usually gets back to the way it's supposed to be. Likewise, its setting allows it to completely ignore such world-changing events from the main comics, such as Civil War. April 2010 saw the cancellation of practically all the series. The survivors (Spider-Man and Super Heroes) became renumbered, starting again from #1. 'Marvel Adventures' also dropped from the titles. Spring 2012 will see those series get canceled in favor of a new line, Marvel Universe. This line includes comics tying into the cartoons The Avengers: Earth's Mightiest Heroes and Ultimate Spider-Man. Previous series that have been discontinued include Hulk, Iron Man, Fantastic Four, and The Avengers. Accidental Athlete: In Marvel Adventures Spider-Man #34, Peter Parker is recruited as a shortshop for his high school baseball team after he's seen using his super-powers to deftly catch and return a wayward ball. Team pitcher Flash Thomson is enraged because he suspects Parker's skills are due to illegal drugs, while the Green Goblin wants to eliminate Parker so his son's rival team can win instead. A.I. Is a Crapshoot - It took seconds for Ultron to go into Crush! Kill! Destroy! mode. "Well, that's an all new 'Everything Goes Wrong' speed record!" Also, the creation of Vision. Huge lightning storm + experimental programs + Storm + combat practice robots = Lethal sentient robot. All Your Powers Combined - As in other universes, the Super-Adaptoid has the ability to copy powers and personalities. Quicksilver uses this to defeat it, as having it copy Captain America (comics) gives it enough good guy mojo to reject its creator and run off to become a hero. Attack of the 50-Foot Whatever - Giant Girl, of course. Ant Man and Erik Josten as well, but only for one issue. Biting the Hand Humor - So many. A fan favorite is Doc Samson's "Needs a wife" assessment of Spider-Man when the Avengers go in for therapy. Boisterous Bruiser - Amazingly enough, Hercules manages to be even more this than his 616 counterpart is. The Casanova - Both Tony and Storm. While Tony has his civilian ladies and Black Widow, Storm's hooked up (in the past) with T'challa and Hawkeye, and currently with Thor, as well as getting a Les Yay scene with Giant Girl. Celebrity Blog: Nova spends most of Super Heroes v2 #1 pondering if Magneto has a Twitter account. Chess with Death - Except it's chess with Galactus. More on trope entry. The Chew Toy - Unlike most cases where Wolverine is everywhere, fandom didn't really mind him being a major member of the team, mostly because the writers loved playing him up for gags like Spidey's "Kick Me" sign, the aforementioned pummeling by Odin, the slingshot trick (Spidey again), etc. Cool and Unusual Punishment - Iron Man being subjected to the Cute but Cacophonic pit of space kitties as penalty for losing a round of Kree karaoke. Apparently, they're loud enough to even outdo the suit's sound filters, as he ends up mostly deaf for several pages. Deadpan Snarker - Spider-Man especially, but everyone has at least one moment of getting to be this. Even Captain America. Drives Like Crazy - KaZar is a terrible driver, as Spidey will rant about when provoked. Did come in handy, though, when he managed to land a Quinjet on Stegron and his forces completely by accident. Driving Test - Spidey's Spider-sense gives him an advantage...sort of. Engineered Public Confession - Captain America vs. Loki. "Did you just humiliate a deity in front of three million potential worshipers?!" Evil Laugh - For a hero, Storm's surprisingly good at it. 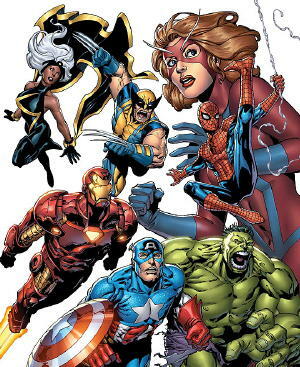 Executive Meddling - Despite previously having ordained that all Marvel Adventures comics were their own self-contained series, thus eliminating the possibility of Continuity Snarl or Continuity Lock Out, Marvel recently decided that they wanted to have the series be more "relevant" to each other. This lead to Avengers being axed and Super-Heroes replacing it as the "canon" team book, with a complete reboot to allow it to tie more to previous stories and the ongoing Spider-Man. Fluffy the Terrible - To an Eldritch Abomination, "Bob" is creatively exotic. Fun Personified - The whole line, but fans especially loved Batroc's appearance. He's just enjoying fighting the Avengers guys so much that you have to grin along. Genius Loci - Ego the Living Planet. Who turns up in the solar system to hit on the Earth. Genre Savvy - "Will anyone ever remember I'm really smart?!" Godwin's Law of Time Travel - A Watcher manages to not get in trouble for acting instead of watching when he returns a dimension-hopping Johnny Storm home. His method of getting out of it is by pointing out that with all the dimension-screwing Johnny was causing, he missed out getting to watch several interesting timelines (including one where the Aztecs somehow won WWII) unfold. Goomba Stomp/Giant Foot of Stomping - The U-Foes found out the hard way that this is an effective tactic when Giant Girl got dropped on them. As did the Absorbing Man, courtesy of the Hulk. Gosh Dang It to Heck - It's a Lighter and Softer genre written for all ages, what do you expect? Groin Attack - Cap, of all people, does this to the Wrecker with his shield at one point. Haunted Headquarters - Before finding out Vision was actually a case of A.I. Is a Crapshoot, the Avengers thought a ghost had infiltrated their base to kill them. Heroes Gone Fishing - The villains probably wouldn't end up getting beaten half the time if they weren't constantly interrupting perfectly normal activities, such as godly dating or a friendly game of basketball. Ho Yay - Captain America (comics)/Iron Man shippers love issue number twenty-seven of the Avengers series. They were seen on what seemed like another date in issue thirty. I Always Wanted to Say That - Due to an unstable time portal, Spider-Man, Ant-Man, Hulk, and Tigra meet Sgt. Nick Fury's Howling Commandos in ancient Egypt. Spider-Man: We're the Avengers. From the future! Man, that was cool. I always wanted to say that. Intimidating Revenue Service - The Avengers fear the taxman more than supervillains. Jive Turkey - The aforementioned Goom, who learned all his English from shows like MTV Raps. Large Ham - Doctor Strange does it intentionally, as inflated confidence and a cheery outlook actually help his powers. Later, he convinces Spidey to give it ago as well as part of a ruse to trick a blind reality-devouring monster, and Spidey's a natural. Lighter and Softer - Than the 616 continuity. Logic Bomb - Reed Richards vs. alien supercomputer. Reed 1, computer 0. Magic Pants - Gleefully lampshaded in Avengers. "I'd rather not, I just got a new suit. ... Yes, it's purple." MST - The historical film of Captain America. "So if it's cool, you said it, and if it's cheesy, the filmmakers added it in." Must Have Caffeine: When Doctor Strange is gliding around from one dimension to another doing his morning rounds, he has a paper cup of coffee in his hand. It's fun to imagine the Sorcerer Supreme stopping by Starbucks before checking in on Nisilette the Unimaginable. Narrative Profanity Filter - While watching a newsreel of Captain America's service in World War II, Cap mentions that a particularly cheesy line was added in by the filmmakers after the fact. When asked what he really said, Cap embarrassedly notes, "I can't say with ladies present." Never Say "Die": In Super Heroes volume 2 #4, Deadpool is never referred to by his code name. Someone would always refer to him as "Wade Wilson. Better known as-" before being interrupted mid-sentence. Oh Crap - Many, but two are especially priceless: the panel where Spidey realizes Captain Stacy just suckered him into revealing his identity to him in Marvel Adventures: Spider-Man, and the reaction of an intergalactic conqueror when he discovers that he and his army are all roughly 1/100th the size of Earthlings in Marvel Adventures: Avengers. Shooting Superman: Baron Zemo attempts to defy Captain America by punching him. However, he only has ordinary person strength and hurts his knuckles. Shout-Out - Mixed in liberally with the Biting the Hand Humor. Iron Man: Like we'd ever shoot the Hulk into space. "The lesson is: trust no one." Stalker with a Crush - Surprisingly enough, yes. Erik "Atlas" Josten's sole appearance in the Avengers title involved him making it look like Hank Pym had intentionally vanished so that he could get closer to Giant Girl while Pym was missing. Ungrateful Bastards - The Baston-Karians, boy howdy: "Why are you still here? You are finished saving our world, are you not?" Unsound Effect - Everywhere, but especially when it comes to Hulk and Batroc. "GAMMABOOOOM!" and "LeThumpt!" indeed. Wouldn't Hurt a Child - At one point the Avengers have a showdown with Loki's Masters of Evil, who have gathered at a middle school, which Loki levitates into the air. Cap is paralysed with horror at the thought of all the kids in the school endangered or killed, only for the Wrecker to lampshade this trope: "There weren't no kids in there! Whaddya think we are, monsters?" You and What Army? - Poor Jamie Madrox. He so badly wants to use this gag on somebody. You Meddling Kids - Spider-Man uses this in an Avengers adventure after unmasking Baron Zemo. This page was last edited on 9 April 2017, at 10:18.